In stock. Order in the next 11 hours, 49 minutes and it will go out today! 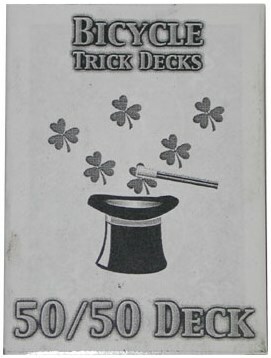 A 50/50 deck is a forcing deck where twenty-six cards are all the same and the other twenty-six are random cards. This allows you to show half the deck to be different before turning the cards over and having someone select a face-down card (which is actually one of your twenty-six force cards). It's a versatile utility deck, suitable for when you want to force a card in an extremely fair way. We aren't able to provide specific forcing values. If you want to use a specific force card, we recommend that you purchase a one-way forcing deck and a normal deck, allowing you to make two of your own 50/50 force decks!